Fall Baby Shower Favors With A Welcoming Autumn Flair! With A Welcoming Autumn Flair! Fall Baby Shower Favors Welcome your guests to your Autumn baby shower and extend a warm thanks for joining you, with these delightful Fall Baby Shower Gift Favors. Baby shower favors in warm inviting Autumn tones are perfect for the Fall season! Don't want the traditional "pink" or "blue" for your baby shower theme? Decorate and gift with brilliant Fall colors. Personalize baby shower gift favors as memorable keepsakes, or select a scrumptious favor delight for guests to enjoy later. The crisp Autumn winds filter in, washing away the balmy Summer ... Are you having a Fall Baby Shower? If so, we have many delightful baby shower favors perfect for your Autumn celebration. Remember to order your Fall Baby Shower Invitations. Looking for favors more specific to your Fall baby shower theme? Check out our Halloween Baby Shower and Goth Baby Shower ideas too. Looking for favors with more of an Elegant Fall Flair? Tip: Remember that Wedding Shower Favors are perfect for an upscale, or formal Baby Shower Theme. You can modify any personalization, if necessary, to blend a beautiful and elegant favor into your baby shower. Give candle baby shower gift favors and watch your guests eyes light up! 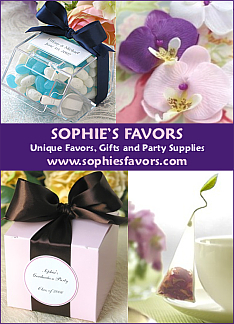 Simple and elegant favors for a more upscale, or formal, baby shower celebration. Choose from an Elegant Leaf Design Candle Favor, Autumn Place Card Holder Candle or stunning Autumn Themed Candle Favors. Baby Shower Favors to brighten your shower & light up their eyes!